Window Warehouse aluminium framed flydoors come standard with fibreglass mesh, and are available in black, white, silver, dune, stone beige & woodland grey. Fibreglass mesh is made of woven fiberglass yarn coated with PVC to make it waterproof, rust proof, non-combustible, stain resistant and easy to clean. 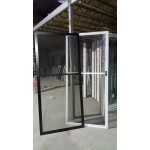 Standard Aluminium Flydoor (to suit stocked 2100 x 1810) Window Warehouse aluminium framed f..